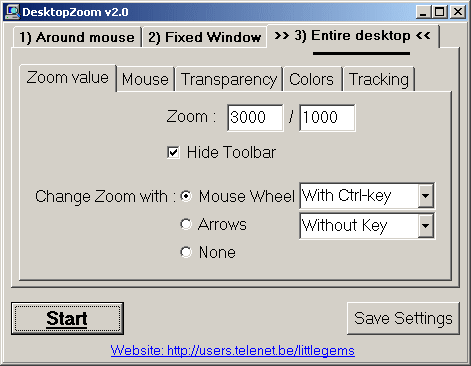 DesktopZoom is a zoom/magnify program with options for zooming around the mouse, zooming a fixed window, zooming the entire desktop, using the mouse inside the zoomed window etc. How to extract: Download the ZIP file and extract to a folder of your choice. Launch DesktopZoom.exe. I have recommended this software elsewhere in the past, but had to use it for real recently after an eye operation, and have uninstalled it. It would always fairly quickly lead to complete system lockup on my Win 7 Home Premium PC, mouse and keyboard completely useless, no pssibility to launch Task manager, hard shutdown the only option. If you download 3.5 you don't even need to disable aero (it does that automatically and re-enables when you close the program). This app is one of a kind. Not only does it do full desktop zooming where you can actually use the desktop, its completely free and portable. Take that pricey alternitives! What makes this app so great is that it is portable light weight and absolutely requires no admin rights whatsoever to use. This enables the visually impaired to have equal access to a public computer, without having to request the installation of assistive software. I really wish I had found this software sooner than I have. I'm now using it almost daily. I work on a lot of computers being a computer technician so the portability factor allows me to easily work on someone's machine. "It can also work on Vista if you disable Aero." Nice app, very good for zooming around the screen. Whether you just want to fool with it around or just use it nicely in some cases (no need to print screen first and then open in paint for zoomed inspection), it does its job. It's very well made.